From the Netflix original series, the music for the House of Cards in Concert and the House of Cards Suite, in both its full-length and abridged versions, are now available from G. Schirmer! Composed and conducted by four-time Emmy award-winner Jeff Beal, the House of Cards in Concert, a co-production of CAMI (Columbia Artists Management LLC) and Knight Takes King Productions, is a full-evening symphonic event performed live with orchestra and a video montage of scenes from the series projected over the stage. Performances of the House of Cards in Concert can be booked through Columbia Artists Management LLC (CAMI). Please contact Tim Fox (timfox@cami.com) or Alison Ahart Williams (aaw@cami.com) for further information. 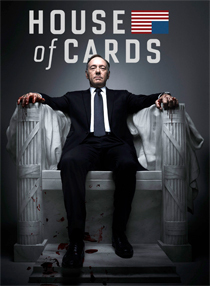 Much shorter in duration but rich in intrigue, Beal's House of Cards Suite is comprised of themes from the first season of the show, ending with the Main Title music. Beal completed the Suite in 2014, in honor of the Oakland Youth Symphony's 50-year anniversary. "The US adaptation of House Of Cards," describes Beal, "is a hybrid story, which layers Shakespearian, Machiavellian intrigue over a backdrop of contemporary politics. There is a sophistication and wit to these characters . . . I strove to give a musical voice to their world in the music; to somehow echo the complex, dangerous and sly waters they tread in their quest for power and revenge." Beal is known for his diverse musical approach to film and TV scoring, having written award-winning scores for the films Pollock (2000), Appaloosa (2008), Wilde Salome (2011), and Blackfish (2013), and for television including the shows Monk (2002), Rome (2005), Carnivale (2003), The Company (2007). Now based in Los Angeles, Beal pursued a career as a jazz recording artist and composer in New York and then San Francisco, after studying composition with Christopher Rouse at the Eastman School of Music. He has recorded numerous recordings for Island, Mercury, and Koch Jazz record labels as a performer (trumpet) and composer. With musical roots as a jazz trumpeter and recording artist, Beal's compositions are infused with a deep understanding of improvisation, rhythm and spontaneity. Beal's work has been performed and recorded by world-renowned soloists, ensembles, and orchestras, including clarinetists Eddie Daniels and Chicago Symphony principal Larry Combs, the American Jazz Philharmonic, and the symphonies of St. Louis, Rochester, Pacific, Frankfurt, Munich, and Detroit.